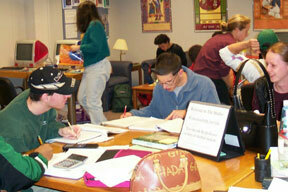 It’s a place to study and do your homework and realize you’re not the only one having difficulty. It is a place where you realize your own strengths when you help someone else and it’s a place with a feeling of camaraderie and teamwork. You are not learning in a vacuum all by yourself. I am a very busy single mom, taking three classes while working part-time. I normally do most of my mathematics homework in the Studio and have received much needed support and help there. I have many doubts about my math abilities and the Studio has been a place to relax as well as get help. 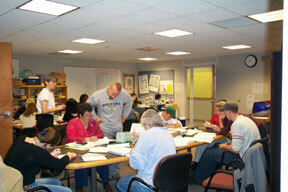 If you would like an individual one-on-one peer tutoring appointment, contact the Peer Tutoring Program at 775-1330.